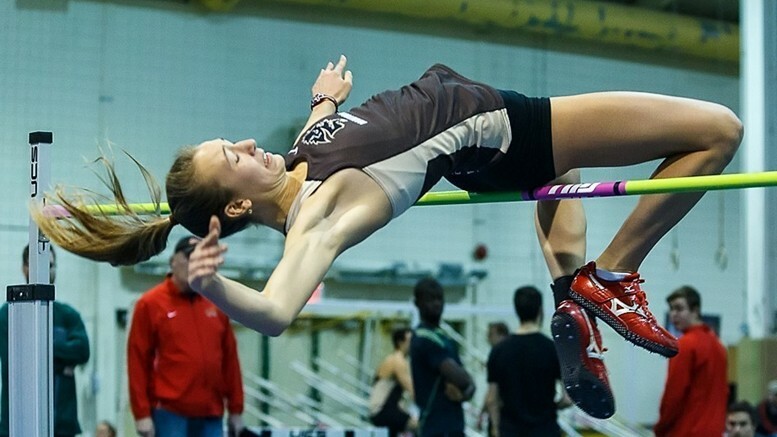 The University of Manitoba Bisons track and field team has made strides over the past few seasons and with a strong roster for both the women and men beginning to come into form, the sky is the limit. Below are the stories of a handful of Bison athletes as they aim for big things in 2016. I took an unlikely route to find track that had me competing in a wide variety of sports with basketball being my main priority. It wasn’t until the last month of high school that I even decided to start attempting track and field and the individuality is what has kept me in the sport up until now. I set high standards for myself and once I break them I continue to make a new set of standards. This year looks promising for our fairly young team looking to give the amazing fifth year athletes their well-deserved swan song. The boys’ side is continuing to show they are a title contender and the women’s side is showing that they have the pieces to put up a fight as well. Personally I’m just aiming to improve. Whether that’s on PRs [personal records] or past results at certain meets, no matter how well I perform, I can be happy but not satisfied. I’ve been captain of the Bisons track & field team for the past four years; this year my goals are very large and I want to stand on not only the Canada West Podium but also the CIS podium this season. I will have two primary events this year, the 60-metre and long jump. This year is my first full year of long jump, after making finals and finishing eighth in the country at this year’s Canadian Senior Nationals. After last year’s injuries I have a newfound appreciation for my teammates, the sport, and all the other blessings that come with being part of such an amazing team. I would like to thank my coaches – head coaches Claude Berube, Alex Gardiner, and my event coaches Rory McIntyre and Mingpu Wu for also believing in my ability and me. This is my final year and I need to perform to the best of my ability on and off the track. I compete in high jump and have recently started pole-vaulting as well. My love for competition started at a young age as a multi-sport athlete. Through high school I competed in track and field and enjoyed the mental and physical challenge of the sport. I jumped my personal best of 1.73 metres in high jump last season at the CIS championships. My goal for this season is to jump 1.78 metres. I am proud to be able to represent Manitoba at track meets, and am grateful to have very talented and supportive teammates to compete alongside. I am a mid-distance and distance runner competing in events from the 400-metre to cross country, but the 1,500-metre is my main event. I started my track career in grade 9 with Winnipeg Optimist Athletics. I was not very involved in the sport until my indoor season in grade 10. That year, I ran a 10 second personal best in the 800, which caused me to finally start to take the sport seriously. I continued to improve in my various races so when I raced high school provincials in my grade 12 year I won the 1,500-metre and the 3,000-metre, and came second in the 800 metre. Over my university career I have been a Second Team All-Canadian in cross country, a First-Team and Second-Team All-Star in Canada West in cross country, third in the 4×800 and third in the 3,000-metre at Canada West track and field indoors. My goals for this season are to make CIS standard and compete at the CIS for the 1,500-metre and for the 4×800. I am an international student from Pakistan and am very happy to be competing this year; last year I was at the International College of Manitoba and was not able to compete for the University of Manitoba. I was hurt because I was beyond excited to be a part of Bisons track and field, but this year I get to wear the singlet and compete for my school. I will be competing in the 60-metre, 300-metre, and 4×200-metre relay races. I’ve also qualified to represent Pakistan at this year’s International Association of Athletics Federations World Indoor Track & Field Championships in Oregon. My goals this year are to qualify for this year’s CIS Championships, and medal at the 2016 Track & Field Canada West Championships. I would like to thank Canada, the University of Manitoba, and my Bisons track and field team for welcoming me with open arms. My former gymnastics coach was a pole-vaulter and invited me to watch one of her track meets. While watching, I noticed how much fun all the athletes were having and I was truly amazed at how they would sprint down the runway and launch themselves into the air, as if they were flying. They were fearless. When I stopped gymnastics, I tried pole vaulting and this is now my seventh year of being a vaulter. I jumped my personal best of 3.81 metres last year at the CIS championships in Windsor. My goal for this season is to jump four metres and place in the top three at the championships. I started running in grade four and participated in cross-country and track throughout elementary school and high school, but for the most part I played soccer. In grade 11, I decided to switch over to track and have focused on it since. This past summer I competed at the Western Canada Summer Games. I run both cross-country and track and my events on the track are the 600, the 800, the 1,000, and the 1,500- metres. This is my second year as a Bison and I am proud to be a part of such an amazing team. Individually, my goal this indoor season is to focus on the 600-metre and the 1,000-metre and then compete in one or both at the Canada West Championships in Saskatoon this February. Since both events are only offered in indoor it’s nice to see the progression in them from last year. In terms of team events, my goal is to make the 4x 800-relay team and then hopefully help the team qualify for the CIS Championships in York in March. I had a great experience as part of the relay team last year so I’m hoping we can make it back. In my first two years on the team I have made both the Canada West team individually for triple jump, long jump and the 300-metre as well as the CIS team for the 4×200-meter relay. This year however my goals have grown larger as I not only want to make the CIS team for a relay but also individually for triple jump. It’s early in the season and seeing the improvements already made technically in my chosen events, I know with help of my individual event coaches Rory McIntyre and Alanna Boudreau I will succeed. I would lastly like to thank my team as a whole for making these three years already so memorable. I can’t wait to see what this season as well as the seasons to come have in store. The women’s team has grown immensely in strength and I hope I can be a leader that can one day bring home a Canada West banner.